This article is stored on the brian894x4.com for easier retrieval. transmission with the V6 engine. turbo-charged 3.0-litre diesel on others. behaves more like that of a family sedan than a workhorse utility. Quality CD audio system with four speakers. alloy wheels, sidesteps, a hefty alloy roll bar and lots of chrome. 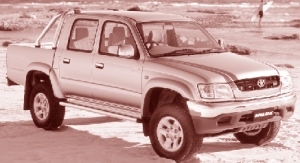 All 4x4 models feature a two-speed transfer case and part-time four-wheel-drive system. On the SR5 ? 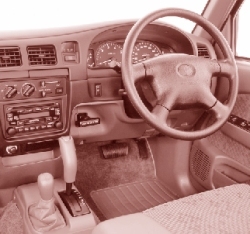 which features an automatic disconnecting front differential (ADD) ? automatic transmission. All other 4x4 models feature manual-locking front hubs. journal-tested SR5 V6 auto retails for $44,040. Unfortunately, air-conditioning is optional. on-again, off-again V8 has now been reintroduced as the only petrol engine on offer. manual, using the gated selector. system with variable-ratio rack-and-pinion steering. Refrigerator inside its huge centre console. Cruise control on V8 and turbo-diesel models. Dual SRS airbags are standard across the entire range. transmission ? proved surprisingly light and easy to drive on a Police Journal test run. and steering provide a better ride with more nimble handling. Prices for the eight-model 100 Series range from $51,990 to $89,900. 4x4 and the Land Cruiser 100.